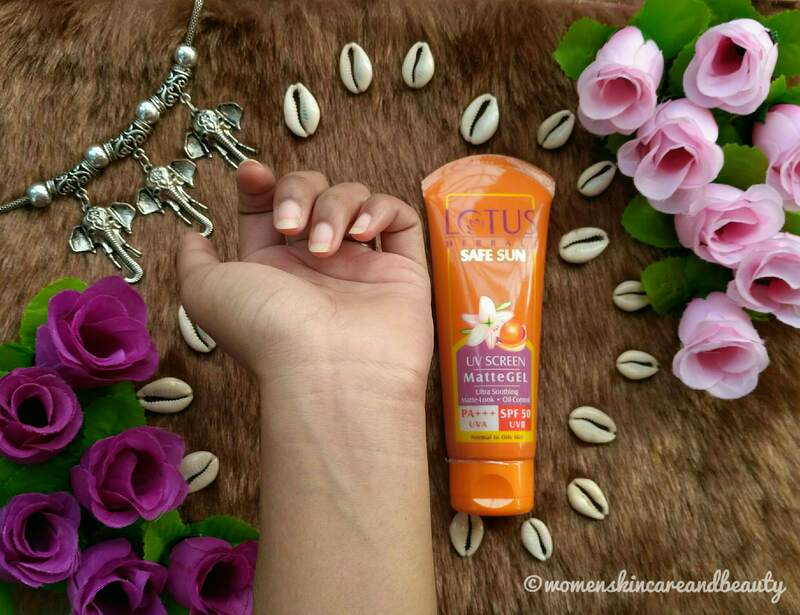 In my cupboard, I have quite a few products that I buy repeatedly and out of them, the one I just cannot live without is Lotus Herbals matte gel sunscreen… I have been using this sunscreen for more than 4 years now! DESCRIPTION: Ultra soothing. Matte-look. Oil-control. PA+++ (UVA). SPF 50 (UVB). 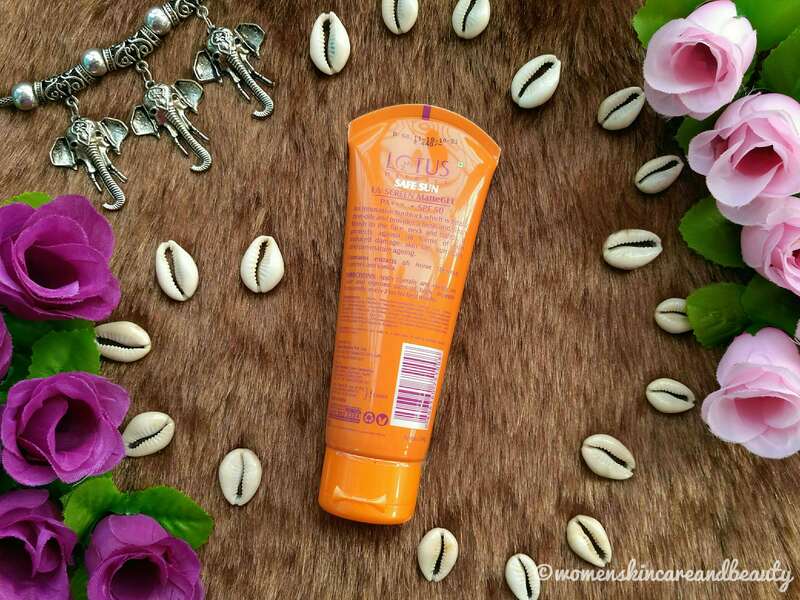 An innovative sunblock which is totally non-oily and provides a fresh and clean finish to the face, neck and hands. It protects against all forms of sun induced damage: skin tan, sun burn and pre-mature ageing. Contains extracts of: Horse Chestnut, Comfrey and Vanilla. DIRECTIONS: Apply liberally and evenly on face and exposed parts of body. Reapply frequently, every 2 hrs for best results. INGREDIENTS: Water, Phenylbenzimidazole Sulfonic Acid, Sodium Polyacrylate (and) Ethylhexyl Stearate (and) Trideceth-6, Cyclopentasiloxane and Dimethicone crosspolymer, Cyclopentasiloxane, Triethanolamine, Symphytum Officinale (Comfrey) Extract, Vanilla Planifolia (Vanilla) Extract, Horse Chestnut Extract, Methylchloroisothiazolinone and Methylisothiazolinone, 2-Phenoxyethanol, Aluminium Starch Octenylsuccinate, Methyl Paraben, Propyl Paraben, Fragrance. CAUTION: For external use only. In a rare case, if rash & irritation occurs, discontinue use. This matte gel sunscreen is translucent white in colour and has a lightweight, non-sticky and non-greasy gel texture… It has a fresh, soothing fragrance which is actually quite mild and I don’t think that it is going to bother the sensitive noses at all! I have a combination skin type which becomes really oily during the summers and gets quite dry and stretchy during the winters… I have been using this sunscreen regularly for years now, irrespective of the season and it has never failed me, till date! 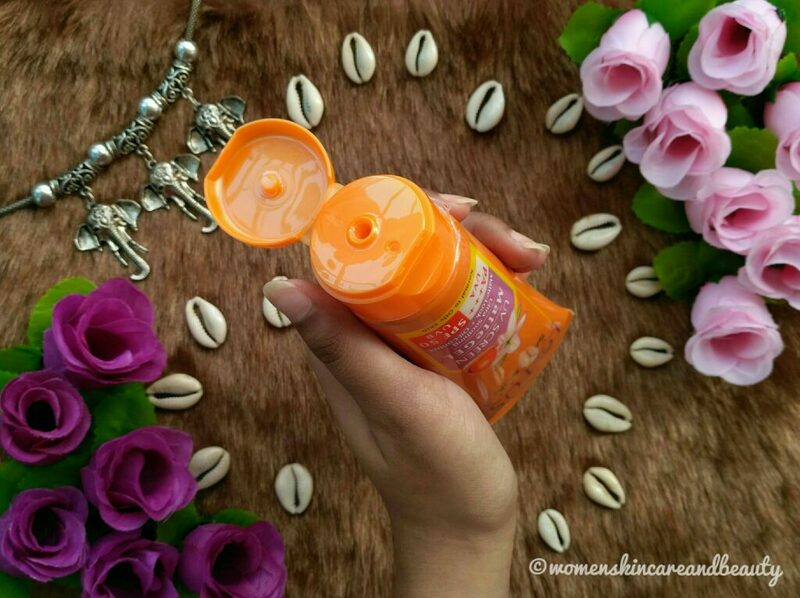 It keeps my skin well hydrated during the summers while it doesn’t dry out my skin during the winters! I am a college-goer and facing the Sun is inevitable for me! This sunscreen has been working as a saviour for me for 4 years now! It provides my skin with optimal sun protection and I have never got sunburns after using this sunscreen! Quite affordable and easily available both online (Amazon, Flipkart, Nykaa, Purplle) as well as offline (local stores/supermarkets)! Leak-proof, durable and travel-friendly packaging. Has a lightweight, non-sticky and non-greasy gel texture. Gets absorbed into the skin with ease and leaves the surface of the skin smooth! Doesn’t crumble down easily when rubbed, unlike most of the other gel sunscreens! Provides a good amount of hydration and doesn’t make the skin feel dry or stretchy. Broad-spectrum sunscreen; provides optimal protection from the sun and prevents sunburn and suntan to a GREAT extent! Suitable for all skin types; people with oily to normal-dry skin types can use it throughout the year while people with dry to extremely dry skin types can use it during the warmer months! Contains a good amount of chemicals, including parabens. 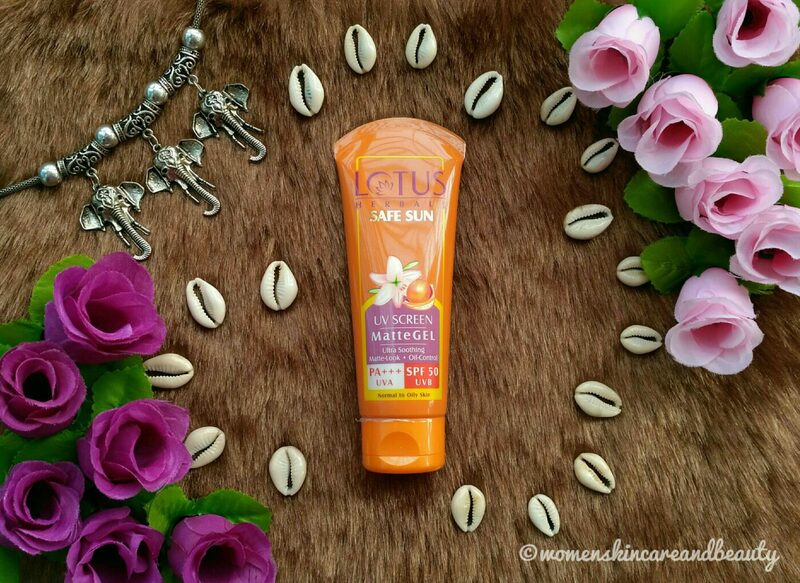 I have used Lotus but had to discontinue it as it made my skin very oily . That’s really singular! This never made my face oily! Lotus products are usually quite good. I have used a few of them, but not the sunscreen gel. I am quite impressed by the product after reading your honest review. I might use this product next time. I have heard so many good things about the Lotus sunscreen, unfortunately when I tried it, it made me break out. That is quite strange as I rarely react to products. I did enjoy reading your review and how detailed it was. Very informative post. I never used though but will give a try. Glad its a matt finish as I cannot manage a regular sunscreen due to my oily skin. Will try for sure. 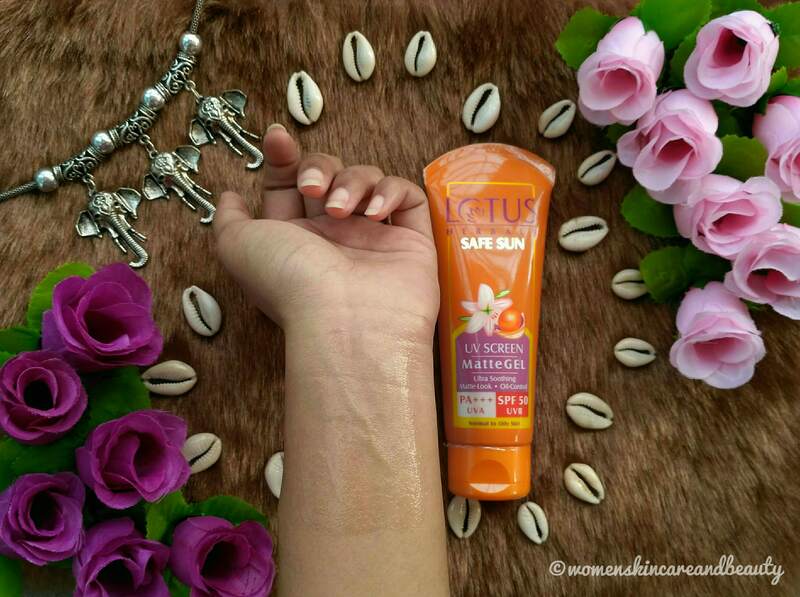 I used to use this sunscreen by lotus since my college days and completely in love with the effect. Very nice detailed review.. Though it has parabens and chemicals but it works well to protect skin from sun’s harmful rays so it will be used by many people. Oily skin needs a lightweight and mattifying sunscreen. Lotus matte sunscreen is one of the most used sunscreen. I love your detailed review. Thank you for sharing a review on this amazing product. We are planning a vacation next week so my sister was looking for a product like this. Will surely share the same with her, she is definitely going to like this one. I think face sweat is the major issue for me too because of oily skin. This definitely sounds like good option to try for. Its lightweight, gives matte finish, plus the SPF is also good, sounds amazing. Thanks for the review, never tried this but will definitely give it a try. I agree, gel based products are great! I have seen beauty bloggers raving about it but don’t know why I never really liked it’s feel my skin. Your review tempts me to give it another try. I agree, it has chemicals but it is really effective! I love the honesty you infuse in your reviews. Yes any sane person wouldn’t vigorously rub their skin the way you have described. I have combo skin type too. Will give this a try. I quite like lotus products. I have used the sun block cream and found it quite effective. I’m sure this is superb too. Thanks for sharing your review here. I am also used this product. this is really perfect for summer. It is better than other branded sunscreen. You have given the product a high rating, but I have to tell you about my personal experience with it. I have highly sensitive skin and this one broke me out! Ah, that’s bad! It has a lot of chemicals, so, that’s quite possible! Amazing and beautiful post. 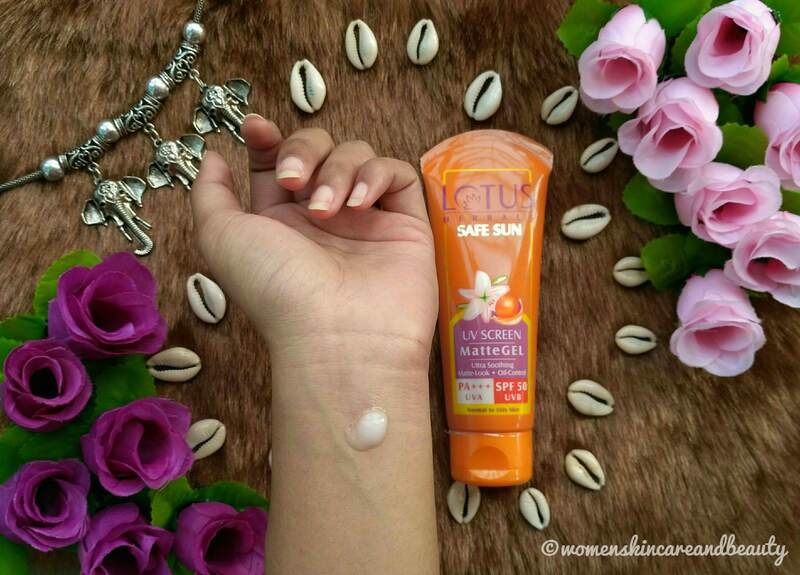 Superb Lotus Herbals safe sun matte gel sunscreen to protect from UV rays. The packaging of the lotus herbals sunscreen is so good. It’s best to soothe the Skin. Great thoughts. Wow, nice review. Among all the lotus herbals sunscreens i really like it very much. It is one of the best sunscreen for the summer season.